Her group has always opposed One Bin For All. 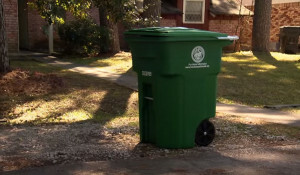 They doubt the city can achieve its goal of recycling up to 75 percent of waste because regular trash would contaminate some of the recyclables when they are put in the same bin. They also fear the new facility would contribute to air pollution. The fact that this project is dragging along is good news for Scruggs. She said the group continues to advocate a zero-waste goal and even calls for a three-bin program, which would add a separate bin for compost. That is already happening in Austin and San Antonio.